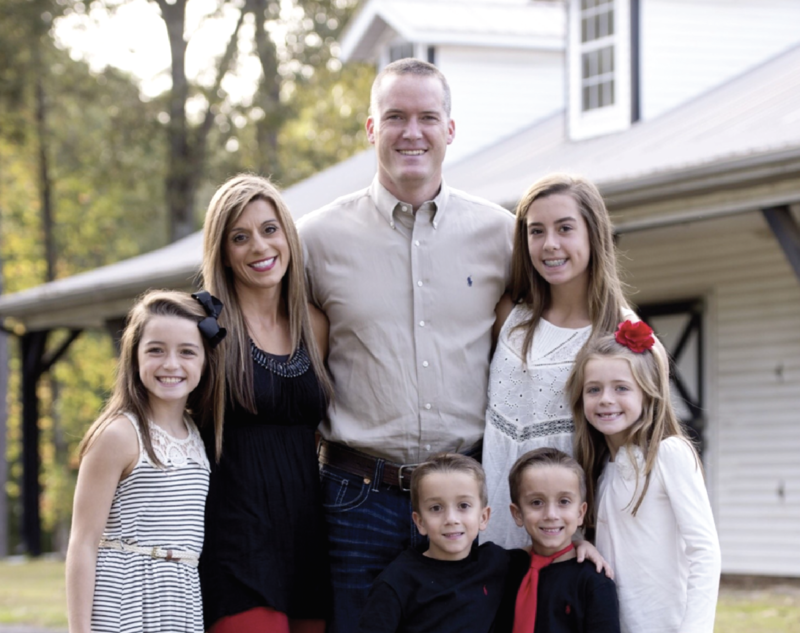 From the time he and his wife, Dana, met in eighth grade, Rob Pate ’02 had his life planned out. He and Dana would marry, he would play football for Auburn University, he would move on to an NFL career and they’d live happily ever after. “Rob does not like being uncomfortable,” said Dana Pate ’02. Rob, she said, is a planner. The road to the happily ever after took a few unexpected turns. Pate proposed to his middle-school sweetheart in eighth grade, and the two married the summer before their junior year at Auburn. He played football for the Auburn Tigers under Coach Terry Bowden, but found his position changed when Coach Tommy Tuberville came on board. Adapting to new positions on the field was going to take a lot of practice and work, hard work. A Texas native named Kevin Yoxall ingrained the motto “work, hard work” into every football player as Auburn’s strength and conditioning coach. “The first thing Tuberville told us was, ‘I just hired two men [strength and conditioning coaches Yoxall and Phillip Lolley] who can physically throw you out the window,’ ” Pate said. With Yoxall, Pate and his teammates quickly learned they would have to endure some of the most intense strength training of their football careers. Although the workouts were brutal, Pate believed that if he could make it through them, he could get through anything in life. Pate saw his strength coach as a father figure and mentor who molded him to take on any obstacle in life. “By the end of the winter, the players could run 12 gassers,” Yoxall said. However, no amount of gruesome workouts could prepare Pate for the summer before his senior year. That whole summer, no one knew what was wrong with Pate. He spent a majority of his summer at the doctor’s office. No diagnosis was ever offered. “I had so many problems with my muscles,” Rob said. “I was constantly having muscle spasms and muscle cramps.” Doctors rotated different medicines and even injected him with steroids. The side effects made it a constant battle just to get out onto the practice field. “I remember having to adjust a lot of his workout schedule because fatigue and loss of strength was a huge part of this,” Yoxall said. “It consumed him, mentally,” said Dana, her voice cracking. “As a wife, I didn’t know what to do.” She was helpless, watching her husband suffer with no way to alleviate his pain. Pate knew every day that passed with him in bed and not on the field sent his NFL stock value down. However, he managed to recover enough to be ready for the first game of his senior year. Things finally were going Pate’s way again. He played well, but felt even better after discovering Dana was pregnant with their first child, Claire, before facing Georgia nine games later. She would become the eldest of their five children. Rob and Dana Pate spent 2001 NFL draft weekend in Panama City, Fla., but his NFL dreams weren’t dead. His parents called on Saturday night at 5 p.m. and said the San Diego Chargers wanted him to report to training camp—at 7 a.m. the next morning. He made it on time. If Pate was cut from the Chargers too late, he would miss the deadline to apply for the fall semester at Auburn and delay his plans to get his degree. Those were his plans, but once again, life had different ones. When he hit the ground, his shoulder came out of its socket; when he got back up, it popped back into place. He was released the next day even though the team doctors said he could still play. Rob landed a job at Cooper Tires in Auburn, but, again, it was going to take a lot of work—8 a.m. to 5 p.m. hard work. Dana worked at a daycare so she could watch over Claire. Pate’s NFL career might have ended, but not his drive. 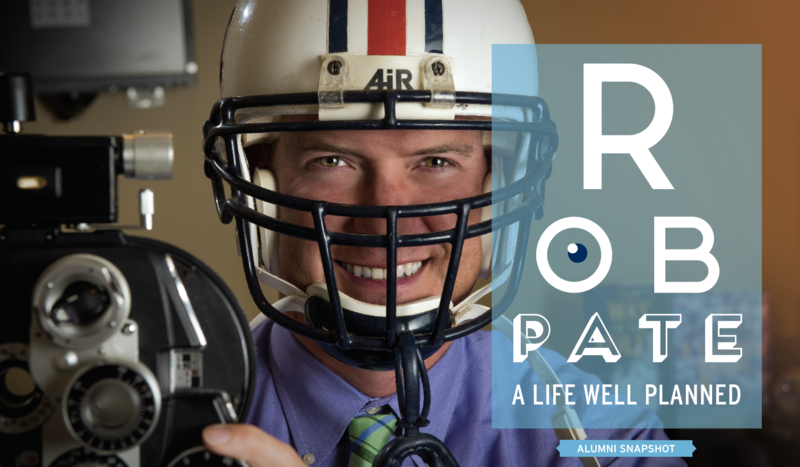 He finished his bachelor’s degree at Auburn in 2002, then went on to graduate in 2007 from optometry school at the University of Alabama Birmingham. The young physician spent eight years at EyeCare Associates in Hoover before joining Basden Eye Care back in the family’s familiar home turf of Auburn. Finally, free of uncertainty, his present and future are as clear as a fresh pair of lenses. In 2014, he was named the Young Optometrist of the Year by the American Optometric Association.